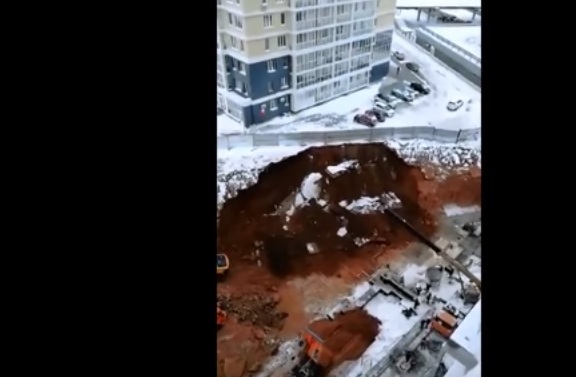 In Naberezhnye Chelny (Russia), during the construction work in the 21st microdistrict, the land collapsed. Everything happened at the intersection of Syuyumbike and Vakhitov Avenue. As can be seen on the staff, because of the failure formed a huge pit, which almost fell a metal fence enclosing the territory. According to the eyewitness, the collapse occurred on the territory of the facility, which is being built by the group of companies “Profit”. At the time of the incident, people worked there. Dozens of cubic meters of frozen soil could bury them alive. Apparently, the cause of the incident could be the mistake of the designers. Literally a few meters from the formed pit is a high-rise building, where cars are parked. Now they are separated from the abyss only by the fence. The area of ​​failure at any time may increase. And this threatens a big accident in the utility networks.